The most important function of a bridge on an acoustic guitar is of course to support the strings. Furthermore this is where the strings’ vibrations are transmitted to the top. For this reason, the bridge is of immense importance reagarding the tonal properties of an instrument. The free-standing bridge, whose mode of operation I don’t want to show in detail, is adopted from bowed instruments. Here we have a vertical pressure on the instruments top. The other two bridge-types bring about torsion-stress on the top. 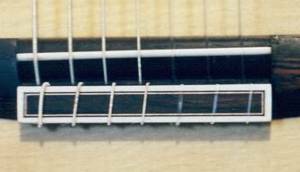 This means that the strings pull on the upper edge of the saddle towards the neck, leading to a more or less significant deformation of the instruments top. How is the sound transmitted to the top? A widespread erroneous belief is the idea that the bridge moves mainly up and down. In fact, the bridge moves mainly to and fro in a kind of a rocking motion which is caused by the oscillation of the strings. This movement causes the distance between the nut and the saddle to change slightly. This distance is the shortest at the extremities of the oscillating motion. It is often claimed that a string fixture with double holes would make the sound more powerful, strengthen the treble or whatever. The increased angle of the strings over the saddle is often given as the reason. As can easily be seen, the string is pulled up by itself when leaving the hole in the tie block. The angle over the saddle is diminuished by this. On tie blocks with double holes the string runs directly from the hole in the tie block to the upper edge of the saddle. So the angle is increased. Regarding the above explanation we can show that this can’t be true, because the bridge rocks as a whole and no string is actually “hammering” on the saddle at all. What really makes a big difference on the other hand is the height of the saddle in relation to the surface of the top. This value strongly changes the strings’ leverage transmitted to the top. I have illustrated this in the following drawing in a simplified version. The string tension is described with the blue arrow. One can easily imagine that the leverage is much higher on the example on the right with the high bridge.On steel-string guitars this works in a similar manner. Also here, the whole bridge is set primarily into a rocking motion. Apparently not much, but in fact quite a lot. The problem is, that the “perfect” height is dependent on the stiffness of the top-construction, the choice of strings and finally on the players personal sound preference. 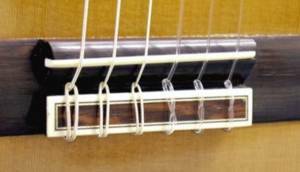 A very soft top with hard strings can sound strangled whilst a stiff top with a low bridge and soft strings will not be able to set the top properly in motion. What else may be important? Another important parameter is the bridges weight. A very light-weighted bridge is less resistant against the strings vibration, but will stop to move earlier. There is a quick response, but the sustain will be much shorter. With a heavy bridge, the opposite will be true.Unfortunately an ideal weight for a guitar bridge is not existent as was already stated concerning the height of the bridge previously.